Has it been your dream to stay at a destination luxury hotel? 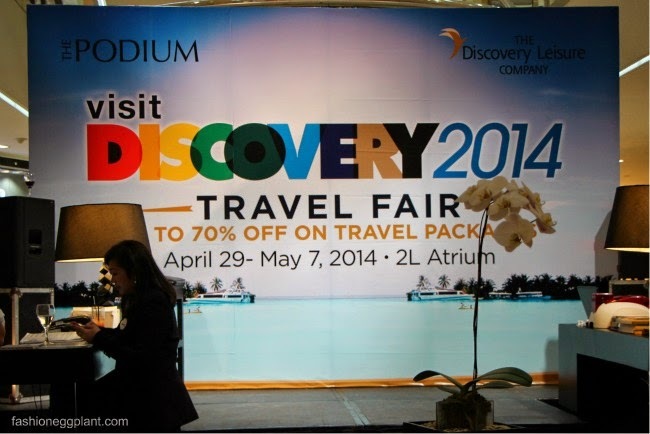 With the Discovery 2014 Travel Fair, I can stop daydreaming and actually turn it into a reality! From April 29-May 7, 2014, enjoy discounts of up to 70% for all Discovery Leisure Chain hotels in the Philippines when you book your vacation at the Discovery Travel Mart, 2L Atrium, Podium. Treat your family to a Staycation! Room availability is for Fridays, Saturdays and Sundays only from April 25-December 28 2014 only. Or escape the heat, take a trek to Tagaytay and enjoy 70% off on weekday rack rates at Discovery Country Suites. Pay only P5000 instead of P15,343.75 for a De Luxe suite or P5500 for a Premier Suite. Booking period is from August 1 - November 30, 2014. Rates are not applicable on weekends (Friday and Saturday) and Holidays. Add a surcharge of P2000 nett if you want to avail on weekends and holidays. Discovery Shores Boracay. No introduction needed. or get it at 50% : P10,500 when you book for June 1 - October 29, 2014. P12,650 when you book for June 1 - October 29, 2014. P13,750 when you book for June 1 - October 29, 2014. Get it for just P7,700 when you book between May 1-31/Oct 30-Dec20, 2014. Get it for just P8,525 when you book between May 1-31/Oct 30-Dec20, 2014. P7,750 when you book between April 26-30/May 13-20/June 1-Oct 29, 2014. Get it for just P10,200 you book between May 1-31/Oct 30-Dec20/April 26-30/May 13-20. P9,350 when you book between June 1-Oct 29, 2014. Don't you think it's about time you indulged? Book a luxurious vacation now, don't forget to visit the Discovery Travel Fair at the 2nd Level of Podium this April 29 - May 7, 2014 only.